Casita de Colton or otherwise known as Condo C is the largest of three luxury ocean view condos located at 350 Harloe Avenue. Condo C is named La Casita de Colton, within the Tres Tesoros Tri-Plex complex. Tres Tesoros means three treasures. This treasure is one of three ocean view Condos on location. It has three bedrooms/three full baths. Located in the heart of downtown Pismo Beach it is walking distance to beach, restaurants, pier, and parks. Fifteen minutes to wineries. This condo has ocean views to the west, south down the coast, and north up the coast. Longer term 30 nights or more take priority. If you have questions for shorter stays please we may consider shorter stays depending on time of year and only if not booked long term. The main level bedroom is set up for kids or adult kids with a twin over full bunk. The master has a Cal.King and own full bath, large walk-in closet. The guest room is a Queen and own full bath. There is a full bathroom on the main floor off the family room, bunk room and kitchen. Sleeps 6 adults comfortably, maximum 8 including children. There is a deck off the family area with patio furniture for further enjoyment of the sea breeze. There is also a deck off the master bedroom. Amenities include full kitchen and nicely-appointed products for cooking and baking. We have luxury bed sets and linens, a two-car garage, keyless entry, washer and gas dryer, wireless internet access, DirecTV, outdoor patio furniture on decks. This condo has been professionally decorated. Each bedroom has its own flat screen TV, including a flat screen in the living area. There is an iron/ironing board, in the condo. There is a shared foot wash and BBQ with other two condos A and B. Park once and do not move the car until you leave! Larger vehicles may need to park on Harloe Ave.
Condo B is VRBO# 195574 and Condo A is listing # 195553. Inquire to owner/property manager. Property is also viewed Treasures Vacation Rentals. My husband and I completed construction on Tres Tesoros in 2006. We spent about a year designing the Tri-plex. We named the building Tres Tesoros after our three wonderful children. Each condo is named appropriately after one of our three children. We have Condo A... La Casita de Amelia, Condo B... is La Casita de Bailyn and lastly, Condo C is La Casita de Colton. We also have some other properties located just south of Pismo Beach in Oceano, CA. We also have several things in Colorado as well. View All My Rentals below RATES. This is a 23 mile sandy, flat beach. There are tons of things the area has to offer, winter or summer! In the summer, people escape the heat of north, east or south. Tired of crowded and hassle-filled airports, delayed and cancelled flights, traffic, lines, and long hours on Greyhound in the sky? See if this sounds better . . . A two or three-hour drive along the Pacific ocean, through wine country to a little paradise called The Gold Coast. 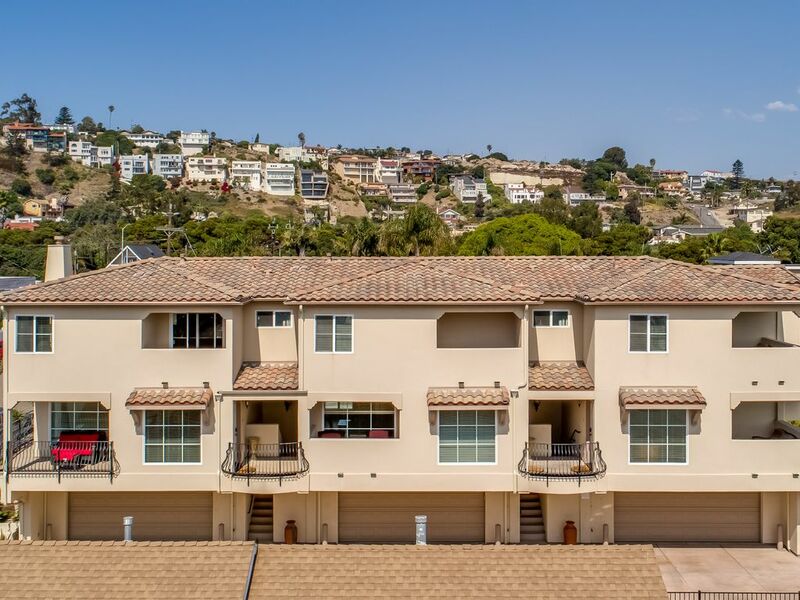 In beautiful Pismo Beach or Oceano, you will be in the middle of a 23-mile long crescent-shaped beach, walking distance to restaurants, shops, and the pier. You can paddle a kayak amidst the otters and pelicans, catch some waves on your long board, ride ATVs or horses on the sand, have a campfire and roast marsh mellows at night, or tour the wineries just minutes from downtown. And if you would rather just relax, there are plenty of places on the sand to put a blanket or chair and just watch the waves roll in. In addition to spring or summer, the locals know that the best-kept secret on the central coast is winter. It’s when the calm, clear and the quiet arrives and the crowds thin. On many days, if you didn’t look at the calendar, you would swear that it was summer. It’s why Thanksgiving, Christmas or New Year’s at the beach is one of the smartest holiday decisions you can make. But book well in advance, because the secret is getting out! King and Queen rooms has private full bath. 3rd bedroom on main level has a full bath in the hallway off the family room and kitchen. This condo is in the heart of downtown Pismo Beach walking distance to restaurants, the beach, pier, bars, shops, rec center, anything your group wants to do downtown. Absolutely its a short 1.5 to 2 blocks to the beach. two car garage for two small or one medium sized vehicle. Some items if not expired. located in Arroyo Grande, Avila and San Luis Obispo, and Nipomo. We do not have an elevator for access to the main level family room or bedrooms. Shared exterior foot wash at the front of the building to wash off boards, feet and toys. Centrally located downtown, rent one or all, see other listings. This is a great place to call home for any length of time. 1.5 blocks to the beach and pier, 15 minutes to wineries, easy access to 101, walking distance to restaurants and downtown activities. The property was very nice, clean and only a few blocks from the beach. Communicate with owners. I would highly recommend! Tres Tesoros was an amazing stay!!! I've never rented a beach house where the owner and property manager we're so passionate about their place which is what we love about it here with their attention to detail.The location made everything so much easier for our family being it was all walking distance (restaurants,beach,pier, and downtown). We fell in love with our condo and how each room was just the perfect fit for our family with how the rooms each had their own bathrooms and tvs. We will be most definitely back this summer and stay for a longer time. Beautiful property! You will not be disappointed! Enjoyed staying in Casita de Colton for a Mom's getaway weekend. Had a great time in the condo...very nicely decorated, very clean and walking distance to the Pismo pier. Nice also to have a garage for all the cars. Would definitely stay here again. Our family's favorite place to stay!! Location, quality, clean...I could go on and on!! Our family has stayed in Condo C many times and have been delighted! My first choice always! Always a pleasure to stay here! We have stayed several times at this complex and each time is wonderful! This past week we stayed in Condo C which was perfect for our family! We had three couples and a child and everyone slept very comfortable. Always super clean, with luxury everything! Being so close to downtown and beach area you don't need a car. Walking distance to most everything. The views from the master bedroom and deck are amazing. Thank you again, Marian for your hospitality. We'll be back! Wineries are within 15 minute drive, there is a children's museum in Paso Robles and a Zoo in Atascadero and Santa Barbara.Shopping at the Outlets, Pismo Beach downtown shops, etc. There are many very good restaurants walking distance from this location. Hearst Castle is a 40 minute drive north. We do have an 12% tax on rent only on short term stays. No tax on stays 30 nights or more. There is a cleaning fee and refundable security deposit. Some summer week/weekends, special events, holidays, we have a minimum of 3 - 7 night minimum. Pricing is subject to change till booked. Winter special events and holidays are also a 3 -7 night minimum stay (depending on dates and at the summer rate per night. Email owner/property manager for minimum stay and pricing. Owner does offer long term stays at discounted rates.